Hot days have melted away to milder, breezy weather. My standard flip-flops have been replaced with Nike Airs and tall boots, paired with sweaters, and the last of the mosquitoes are dying off — fall has officially come to Jeonju. Although the Korean culture believes that eating HOT food in the summer helps to regain the loss of stamina in the heat, I had to wait for the temperature to drop to make a delectable dish part of my regular restaurant rotation. 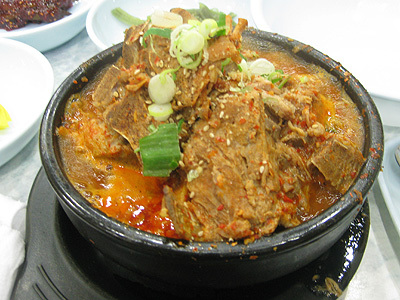 Gamjatang is a spicy soup made with pork back, vegetables, green onions, wild sesame seeds and lots of hot peppers. 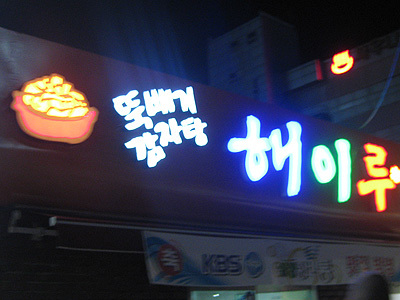 There is a tiny spot in Chonbukdae that we go to get this meal — along with tons of other people. The place is always packed — it’s no wonder though, seeing as this is pretty much the only dish they serve, and they do it soooo well. This picture does it no justice. This fragrant, hot, spicy stew is probably my favorite Korean dish at the moment. When I’m not eating it, I am definitely thinking about it. Next, I began to grab chunks of meat from the soup, and use the chopsticks and tongs to pick off the pork, discarding the bones in a community bowl as I go. As soon as your soup is relatively bone-free, dump in your rice and get to eating! It is a decent amount of work before your meal is ready to be consumed, but every minute you work for it makes your meal taste that much better. Since Jeonju is the food capital of Korea, and this establishment is well-known as one of the best in the city, I’m confident you would be hard-pressed to find a better pot of this soup anywhere in South Korea! 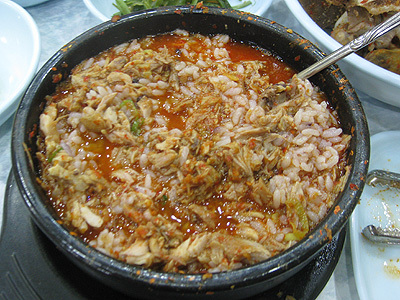 I think it is so cool that, considering how much you enjoy everything there is about food, that you ended up in Jeonju! !